All societies face a key question: how to empower governments to perform essential governmental functions while constraining the arbitrary exercise of power. This balance, always in flux, is particularly fluid in today's China. 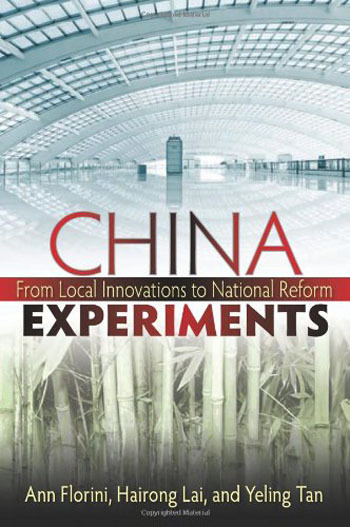 This insightful book examines the changing relationship between that state and its society, as demonstrated by numerous experiments in governance at subnational levels, and explores the implications for China's future political trajectory. Ann Florini, Hairong Lai, and Yeling Tan set their analysis at the level of townships and counties, investigating the striking diversity of China's exploration into different governance tools and comparing these experiments with developments and debates elsewhere in the world. China Experiments draws on multiple cases of innovation to show how local authorities are breaking down traditional models of governance in responding to the challenges posed by the rapid transformations taking place across China's economy and society. The book thus differs from others on China that focus on dynamics taking place at the elite level in Beijing, and is unique in its broad but detailed, empirically grounded analysis. The introduction examines China's changing governance architecture and raises key overarching questions. It addresses the motivations behind the wide variety of experiments underway by which authorities are trying to adapt local governance structures to meet new demands. Chapters 2-5 then explore each type of innovation in detail, from administrative streamlining and elections to partnerships in civil society and transparency measures. Each chapter explains the importance of the experiment in terms of implications for governance and draws upon specific case studies. The final chapter considers what these growing numbers of experiments add up to, whether China is headed towards a stronger more resilient authoritarianism or evolving towards its own version of democracy, and suggests a series of criteria by which China's political trajectory can be assessed.